This is a review of the Armpod monopod, a unique piece of photography equipment that might be considered as one of the best monopods for certain situations. The Armpod monopod was cleverly designed with the video photographer in mind. The designer was a father who was frustrated with getting poor results and fatigued arms while shooting videos of his children. Not only would he miss some great video when he was resting his arms, but his arms would shake when his arm muscle got tired from holding the video camera without any support. Tripods are too big and heavy and traditional monopods don't easily rest on your leg for shooting video while sitting. This Denver Colorado dad wanted to hold his camera in his hand and still get good support for his arm. 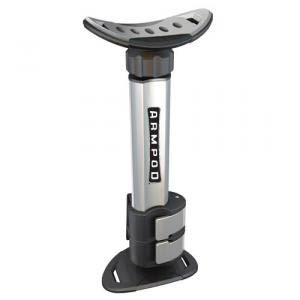 The Armpod Monopod was not designed to have the monopod tip resting on the ground. You can rest the monopod on your leg while shooting or it comes with a handy belt clip which you can use while in a standing position. At the top of the Armpod is a adjustable arm rest which can be removed if you wish to attach your camera directly to the top of the monopod. I am mostly a still photographer and do not have a lot of experience with monopods and shooting video. I can tell you that it is extremely useful to be able to move your body from one location to another without having to lift a monopod up from its resting place. There are manufactures who make monopod holsters for this task, but the Armpod does a better job and can also be used easily in the sitting position as well. One of the big complaints you might come across if you read other monopod reviews is that a particular monopod is too short. This is not the case with the Armpod because it does not have to reach all the way down to the ground. The photo of the Armpod Monopod here on the left shows what it looks like when using in the sitting position. It was designed to support your arm and the camera. Monopods and Tripods support the camera only. This review of Armpod Monopod-stabilizer and arm support was written without any personal experience with using it on my part. It is just my opinion based on my 40 years of photography and using various pieces of photography equipment. Most of the reviews I have written on monopods are for monopods that are used primarily with dSLrs and point and shoot still cameras. Because of the advancements in technology, the use of video and still photography are overlapping as well as some of the equipment used. You can find this to be true when you search for monopod reviews, you will get a mixture of results for video and still cameras. I hope you benefited from reading this review of the Armpod Monopod. It is my mission to provide quality information so that you can improve your photography. Please take advantage of reading the other articles on digital photography tips, lighting, composition, portrait posing, nature and macro photography and of course all of the other articles relating to monopod reviews. This review of the Armpod monopod was just my opinion. As I've confessed elsewhere on my photography blog, it is a great idea to get several opinions on cameras and accessories. I use Amazon quite a bit to research the scrutiny of other photographers. Because Amazon sells such a huge amount of photography through its on-line stores, you can get quite a few opinions from one source.